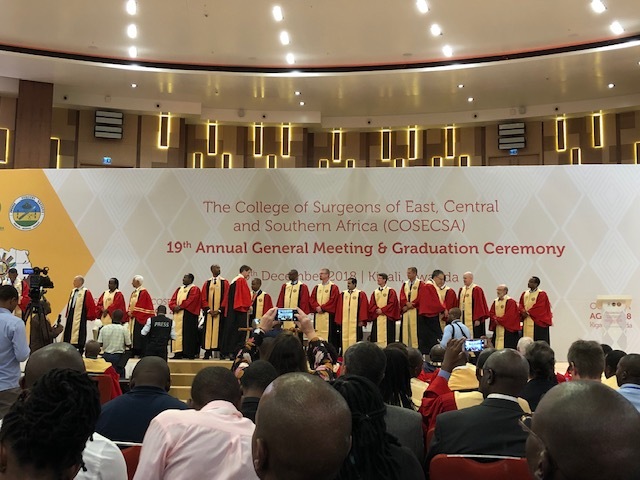 On December 5th-7th, COSECSA, in collaboration with the Rwanda Surgical Society, hosted the COSECSA graduation ceremony and Annual General Meeting (AGM). The graduation ceremony, held on Dec 5, set the tone for the conference. Eminent national and international surgeons gathered to administer exams to candidates across a variety of surgical specialties. The work of countless trainers, dedicated students, and tireless advocates paid off as 85 surgeons from 14 countries graduated to join the health workforce. - Global Surgery (National Surgical, Obstetric, and Anaesthesia Plans). G4 representatives spoke across several sessions and panels alongside other global surgery experts, sharing their work, their challenges, and their vision for the future of COSECSA and global surgery. The conference also featured the launch of the COSECSA Center for Global Surgery, a nucleus built to “enable, abet and promote the Global Surgery activities of the College”. 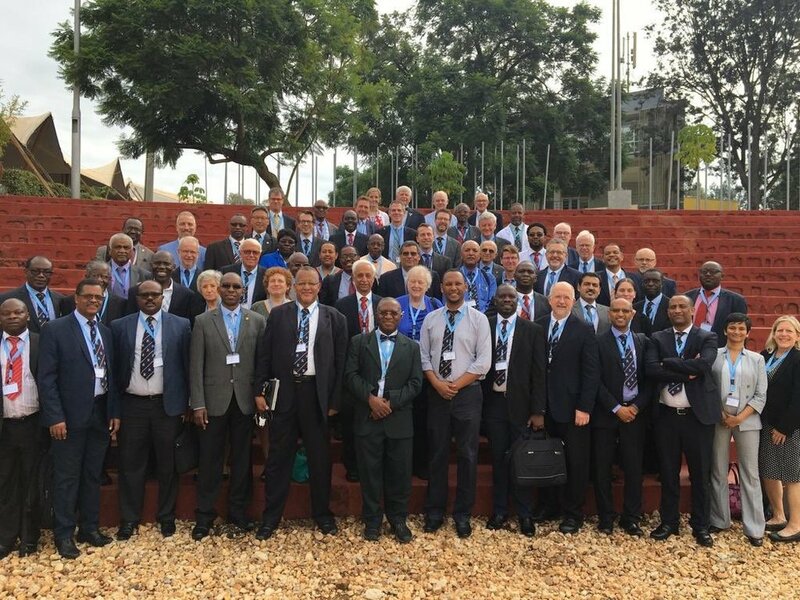 We invite members to collaborate with COSECSA and support this new initiative to advance global surgery and serve more surgical patients in East, Central, and Southern Africa. In this panel, Dr. Maier (President, ACS), Prof. Pankaj Jani (President, COSECSA), and Dr. Yohannah (Lead, CCGS), discussed COSECSA’s collective impact and the future priorities of COSECSA to support increased education, training, and standards of practice and research in surgical care, including the new Center for Global Surgery. This session focused upon COSECSA’s collaborations with international organizations and how these partnerships served to mutually amplify these organization’s impact on the ground. The panel featured G4 members ASAP, the International Society of Surgery (ISS/SIC), the World Federation of Societies of Anaesthesiologists (WFSA), and COSECSA. Dr. Bob Lane (IFSC), of the G4 Alliance Board of Directors, spoke on behalf of G4 and our member organizations, committing to support COSECSA’s work in 2019 and beyond. Currently, there is an estimated shortage of 1 million surgical, anaesthetic, and OB-Gyn in LMICs. By 2030, it is estimated that this workforce must double to sustain the status-quo, let alone account for increases needed to address the unmet burden of surgical disease. Increased education and retention of qualified surgeons and health workers are essential to bridge this gap between urgent need and limited capacity. On this panel, representatives of G4 members COSECSA and RCSI spoke on Expanding Surgical Education in Africa. Dr. Abebe Bekele (COSECSA) outlined the past and present efforts to expand surgical training in Africa as well as COSECSA’s future priorities to scale up their training. Dr. Eric O’Flynn (RCSI) discussed retention challenges and strategies, while Dr. Jakub Galewski (RCSI) spoke to non-specialist surgical training as a strategy for expanding capacity and service delivery. On September 28th, Global Surgery Amsterdam, in partnership with Netherlands Society for International Surgery (NSIS), InciSioN NL, and Doctors of the World, hosted the One World, One Standard of Care symposium in Amsterdam. 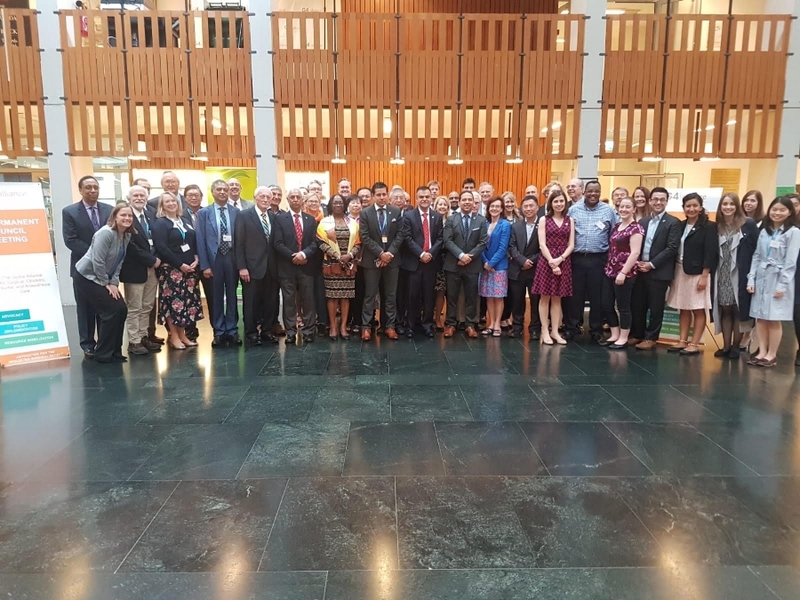 This symposium focused upon skills in global surgery and featured the launch of Global Surgery Amsterdam, a Dutch platform that aims to improve global surgical care by collaborating in research and educational projects. The following is a summary of topics and discussion that took place at this global conference. GSA is a Dutch platform that aims to improve global surgical care by collaborating in research and educational projects. The platform is founded by specialists and residents in general and reconstructive surgery and was launched during the opening symposium on the 28th September 2018. At the symposium we discussed how individuals and organizations from high-income countries could improve surgical care in low resource settings. GSA believes that partnerships between local stakeholders and international institutes/organizations are key to acquire the necessary access to essential surgical and anesthesia care. As we learned during the symposium, there is no ‘one size fits all’ approach and each situation requires a specific strategy with the local partner in the lead. GSA is here to help build these bridges. What happened since the Amsterdam Declaration on Essential Surgical Care in 2014? Prof Pankaj Jani, president of COSECSA and board member of the G4 Alliance, opened the symposium and provided an overview of the achievements of the sub-Saharan region. Despite the increase in local surgical residents and the set-up of training locations outside the capitals, the necessary number of surgeons is not yet reached. Ongoing funding and government support remain needed to improve the training programs. Prof Jani inspired the room by taking us on the journey of a lion cub growing into adolescence, and who is now looking for partners to expand its herd and become the king of the Savanna. After a merger between the two academic hospitals in Amsterdam, the new institute is about to open The Amsterdam Skills Centre. Europe’s largest skills centre will build the next generation learning platform to generate, apply and spread the knowledge about new ways of surgical training. During the symposium we discussed and exchanged ideas with opportunities for future collaboration between local non-governmental organizations like Friendship Bangladesh and surgical societies like COSECSA. For many decades, surgeons from Western countries have been sent on humanitarian missions to provide surgical care in low and middle-income countries. Surgical care was not a priority in international health strategies of leading organizations like the WHO. Within the global health community, the surgical missions were seen as 'parachute missions'. Teams flew in, performed operations and left after a couple of weeks. Patients were treated but there was no structured organization of surgical care in between the missions and knowledge transfer to support local health workers was rare. It was difficult to play a role in local training programs simply because these programs did not exist. Since the emerging global surgery movement started years ago, there has been more demand for structured training initiatives to train local people in providing surgical care. How do NGOs like CapaCare, Doctors of the World and Interplast experience these changes? An important conclusion after the session was that there might still be a role for foreign surgeons ‘on a mission’ for neglected surgical diseases but the quality requirements are high, especially regarding the quality of follow up. And training activities should be embedded in local programs in order to be effective. The master-apprentice relationship as the cornerstone of the training medical specialists has had its day. The training for medical specialists takes a long time, is costly and little use is made of innovative learning methods. Video assisted learning has just started to make an entry into high income countries; but what about the LIMCs? In English it is called leapfrogging: to skip certain gradual changes in order to apply the latest innovations directly, for example to train medical specialists. How can we use medical technology in low-income countries and how can global health care benefit from this. Win-win situation or utopia that medical technology can replace that old master? MLX, Incision and Touch Surgery showed new opportunities to learn quicker and better, thereby limiting the need to use patients as training tools. The gap between the high-tech western medical industry and the daily practice in low income countries is still enormous but the organizations shared a strong ambition to help to narrow this gap in the coming years. Clockwise from top left: HE Robinson Njeru Githae (Ambassador of Kenya to the USA); Dr. Jaymie Ang Henry (Founding ED and Senior Advisor, The G4 Alliance; Henry Family Advised Fund); Ms. Demi-Leigh Nel-Peters (Miss Universe 2017); Ms. Erin Anastasi (Coordinator, Campaign to End Fistula, UNFPA). ‘Making the United Nations Relevant to All People: Global Leadership and Shared Responsibilities for Peaceful, Equitable and Sustainable Societies’ - this theme, the thread woven throughout the 73rd UN General Assembly, speaks to the critical role of partnerships in achieving the Sustainable Development Goals. 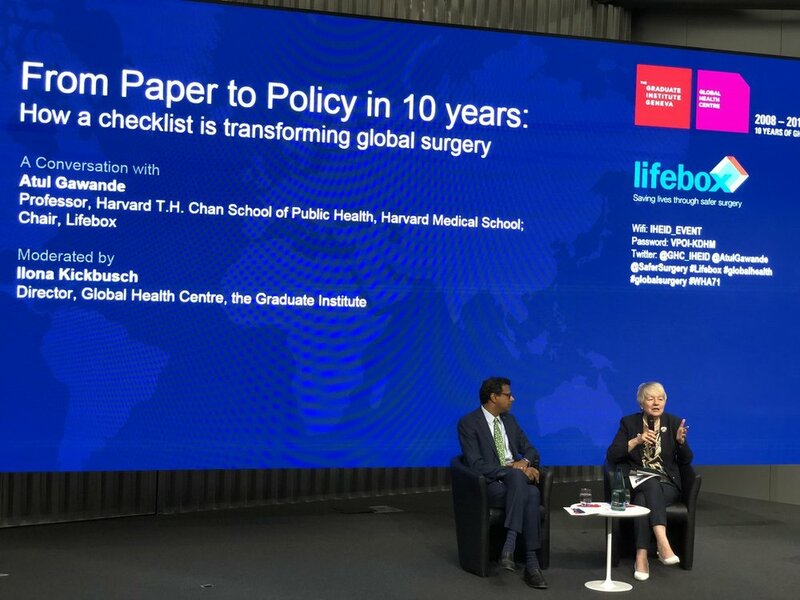 This theme, of course, is closely connected to global surgical equity, an essential aspect of achieving the SDGs, Universal Health Coverage, and to peaceful, equitable, and sustainable societies. Despite the need for safe surgical and anaesthesia care in achieving the SDGs and UHC, there are currently 5 billion people living around the world without access to this essential part of primary care. For these patients, easily preventable and correctable surgical diseases can quickly become physically and financially devastating. To highlight this global inequity as well as the partnerships that are forming to address it, The G4 Alliance and partners hosted “Eradicating Neglected Surgical Diseases: Advancing Universal Health Coverage Through Surgical Systems Strengthening” for an event that brought together government representatives, global surgery stakeholders, and civil society leaders to discuss the eradication of neglected surgical diseases and surgical systems strengthening as an essential part of Universal Health Coverage (UHC) and the Sustainable Development Goals (SDGs). The session featured remarks from His Excellency Robinson Njeru Githae, Ambassador of Kenya to the United States and a special message from the President of Kenya announcing a national commitment and pilot initiative to eradicate neglected surgical diseases. Opening remarks were shared by Ambassador Dr. Neil Parsan, Chair of the G4 Alliance and retired Ambassador of Trinidad and Tobago to the United States and Mexico, Ms. Demi-Leigh Nel-Peters, Miss Universe 2017, Dr. Jaymie Henry, Henry Family Advised Fund, Founding Executive Director of the G4 Alliance and UN Representative for the International Federation of Surgical Colleges, and Ms. Erin Anastasi, Coordinator for the Campaign to End Fistula at the United Nations Population Fund. Left to right: Ambassador Dr. Neil Parsan (Chair, the G4 Alliance & Special Advisor, World Bank Group Former Ambassador of Trinidad and Tobago to the USA and Mexico), Dr. Esther Njoroge (Regional Director for Africa, Smile Train), Dr. Augustino Hellar (Surgeon and Regional Technical Advisor, Jhpiego), Ms. Natalie Draisin (Director, North American Office & United Nations Representative, FIA Foundation). A highlight of this session was a roundtable discussion, featuring regional experts speaking on the topic of neglected surgical diseases and collaborative strategies to address these conditions through surgical systems strengthening. Speakers included Dr. Esther Njoroge, Regional Director for Africa with Smile Train, Dr. Augustino Hellar, Surgeon and Regional Technical Advisor at Jhpiego, and Ms. Natalie Draisin, Director of the North American Office and UN Representative for FIA Foundation. 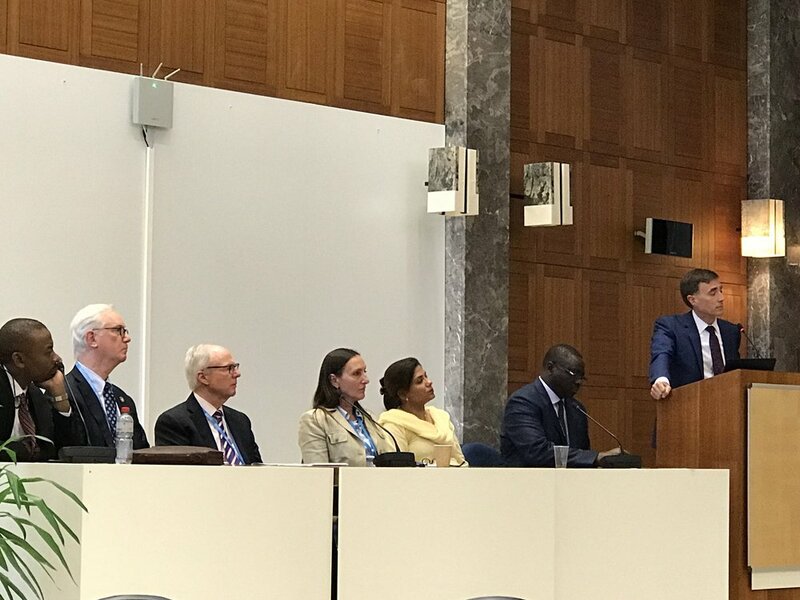 The event wrapped up with a call to action to Member States and civil society partners to work together to eradicate neglected surgical diseases and support the principles of Health for All, first outlined in the Alma Ata declaration 40 years ago! On behalf of our partners, thank you for joining us to help build priority for life-saving surgical and anaesthesia care as part of the UHC and the SDGs. 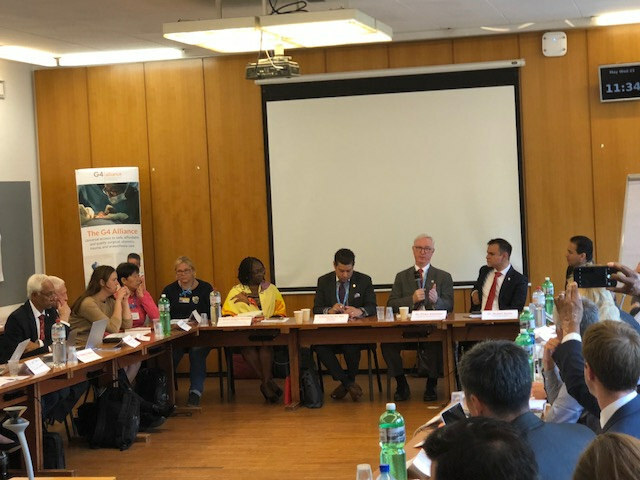 The 3rd G4 Alliance Permanent Council Meeting convened over 50 members, observers, and partners and brought in a number of speakers from the global health community. Thank you for joining us for discussion, networking, and advocacy. We are grateful for the support of our member organizations and the work they do to bring safe surgical, obstetric, trauma, and anaesthesia care to the world's 5 billion neglected surgical patients! Safe Surgical and Anaesthesia Care for 80% of the World by 2030! Don't Forget to Check Out Our New Advocacy Toolkit! The 3rd Permanent Council (PC) Meeting featured updates from our PC Officers, Board of Directors, Secretariat and Working Groups. We also engaged in interactive sessions to better refine our plan of work and chart out a course of action to support our collective target of 80% by 2030 and our goal of increasing access to safe, timely and affordable surgical, obstetric, trauma and anaesthesia care for all those in need. Member networking represented a special focus of this PC Meeting. Participants had the opportunity to engage in a "speed-dating" exercise to get to know their fellow G4 members and foster further partnerships. Feedback was also collected from members to define thematic breakout groups, which met over lunch to share ideas and network. On day 2, members shared specific examples of how engagement with G4 has been valuable in fostering collaboration with fellow members, supporting new partnerships, and improving the effectiveness and impact of their organizations. The G4 Alliance strives to leverage the strengths of our network to support member collaboration. The G4 team and our Working Groups will continue working to identify strategies to best support member engagement and networking. Some examples of ongoing work include our Member Mapping project and online advocacy resources. We would welcome your comments and suggestions to support member networking and meaningful collaboration! This year, we were pleased to welcome a diverse lineup of exceptional speakers. Special guest speakers shared their knowledge and expertise in areas including global surgery, health workforce, effective advocacy strategies, fundraising, policymaker engagement, and gender equality. 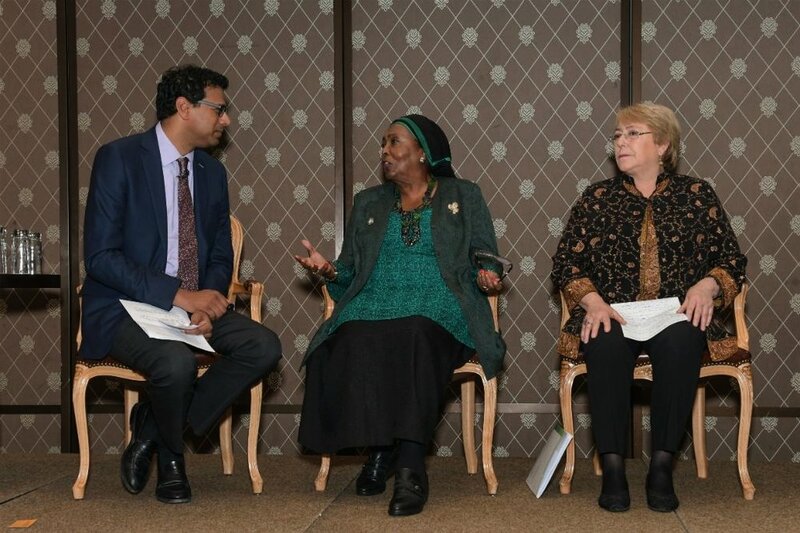 This panel featured experts who discussed their experiences leading successful advocacy movements to promote gender parity at all levels of global health leadership, and to incorporate road safety as part of the post-2015 sustainable development agenda. The second day of our PC Meeting featured a number of speakers who shared their perspectives and advice with G4 members. Sessions were structured as interactive discussions to maximize dynamic engagement. Ms. Ellen Agler addresses the G4 Permanent Council. Our thanks to Dr. David Ljungman who joined us to share an update regarding next steps to advance our joint Statement on the Collection of Surgical and Anesthesia Statistics. This publication was authored by the German Global Surgery Association & Harvard PGGSC, and published by the G4 Alliance. Over 120 global organizations endorsed this statement, which was launched during the 49th UN Statistical Commission in March 2018. We would like to thank all members who took the floor to facilitate sessions, share feedback and provide updates. Interactive planning sessions were facilitated by Sara Anderson (ReSurge International) to help us review our strategic plan and identify highest-value activities to be supported by our network. Member recommendations will be integrated into the secretariat's work plan and will be reflected in future activities. Thanks to all members who joined us for our 3rd PC Meeting in person or remotely. Your continued participation and engagement is essential to the success and impact fo the G4 Alliance!